IMPORTANT INFO for CAC Members! As most everyone has heard, North Cross School will be undergoing some major campus improvements over the next 18 months. The biggest challenges we will face will include parking and walking. Much of our parking will be pushed down towards the athletic fields. We want to convey that we realize this will be a difficult time for all parties involved, but we also want to emphasize that it is an exciting time in the history of our school and Carter Center community. Below is a synopsis of how the campus will be effected for different divisions and areas of the school. Dates may differ slightly from previous updates. In summary, Martin Brothers (MB) has already begun staging the construction trailer in the Willis Hall parking lot. Work is expected to begin on the new driving entrance to the Carter Athletic Center next week (3/25-29). This will involved shutting off the sidewalk area between Willis Hall and Willis Field. The result is that foot traffic between the field fence and the building will be cut off. Students, athletes, and CAC members will have to walk across Willis field using the gates to pass through. (Refer to MAP at the bottom.) 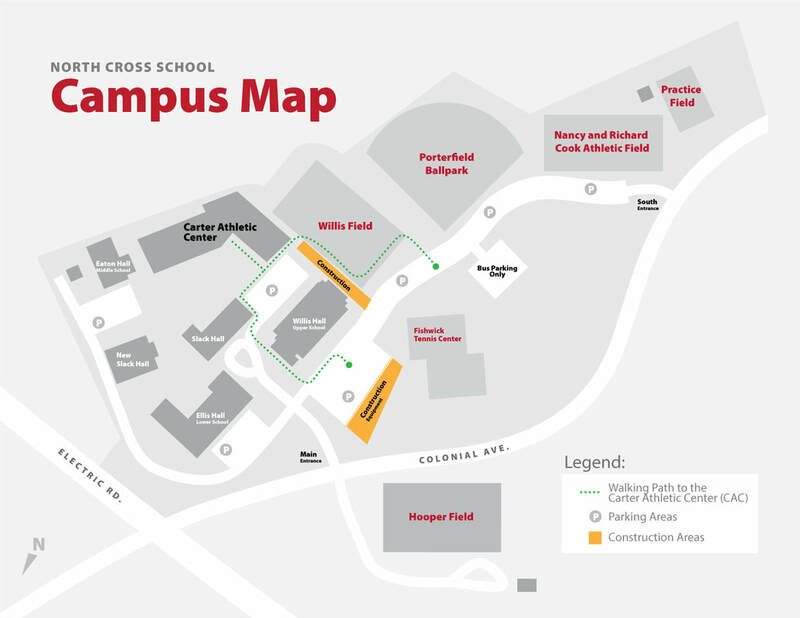 MB will allow car traffic to flow from the rear (South) driving entrance of the school into the rest of campus, but please be careful as you pass along the area of construction (near the Raider Rock). This new CAC driving entrance to the current parking lot will be ready for use by May 13th. The new Ellis Hall (lower school) turnaround may also be addressed during this early site phase. If is is it will also be ready for use by May 13th. During this work MB will allow car traffic to flow all the way around to the Eaton Hall (middle school) parking lot. A corner of the ECP playground fence will need to be removed during this construction, but they will install temporary fencing to keep the students safe at the playground area. As a point of emphasis, Carter Athletic Center members, students, athletes, parents, etc... will not be able to walk between Willis Hall and Willis field during this early period of construction (approximately 6 weeks beginning next week). (Refer to MAP at the bottom.) Also, please be patient with us during this entire period of campus improvements (15-18 months). In the end the Carter Center parking lot will double in capacity. This will be a very positive outcome and a great service to our CAC members. ​the existing driving entrance to the CAC, as well as the traffic circle, will be permanently closed on May 13th.